Hurricane Katrina seen from an eye in the storm. Two weeks after Hurricane Katrina devastated her house and nearly took her life, 24-year-old Kimberly Roberts at last realized the dream of so many New Orleans natives and broke into show business. She did it in Alexandria, Louisiana, in a sports arena that was serving as a Red Cross shelter. 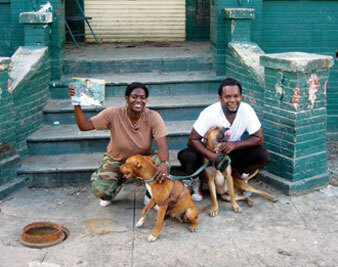 In the echoing cement-block lobby, where a team of documentarians were interviewing a relief worker, Kimberly and her husband, Scott, stepped forward with the assertive friendliness of Lower Ninth Ward street hustlers to mention that they, too, wanted a turn–but only because the filmmakers were a New York crew. “Ain’t gone give this to nobody local,” Kimberly said proudly about the story she was offering. “This got to be worldwide. All the stuff you been seein’ on TV, ain’t nobody got what I got. I got right there in the hurricane,” and she brought her hands together in a box, miming the shape of a video camera. She turned out to be as good as her word; and so to honor a moment that would alter Kimberly and Scott’s lives and determine the course of the movie you’re watching, Tia Lessin and Carl Deal have made this encounter the opening scene of their documentary Trouble the Water. A chance meeting moved the filmmakers to spend a year on and off with Kimberly and Scott: recording them on a foray back into the ruined Ninth Ward, accompanying their futile visit to a makeshift FEMA office in a shopping mall, traveling along as they relocated to a cousin’s home in Memphis and finally returning with them to New Orleans when they decided to come home. Everything about their lives seems to have found its way into the film: the funeral of Kimberly’s grandmother (one of the hospitalized people who were abandoned in the storm); Scott’s regrets over his past career as a drug dealer (“I hated my life; it was horrible”); the hip-hop songs that Kimberly had hoped would make her fortune, and that are now worked into the movie’s soundtrack (“Introducing the music of Black Kold Madina”). But above all, Trouble the Water makes use of Kimberly’s video recordings, which have earned her a co-credit as the film’s director of photography. Only a quarter of an hour of Kimberly’s material appears in Trouble the Water, out of a running time of ninety-six minutes; but it so dominates the rest that the film will surely be known as the Blair Witch Project of Hurricane Katrina documentaries. The comparison involves more than the distorted, front-lit close-up of Kimberly’s face, grayed-out and floating in a nocturnal void–the darkness not of a forest but of the attic where she’d taken refuge during the hurricane. Nor does the Blair Witch analogy stop with your sense of trespassing into someone else’s viewpoint as she haphazardly glimpses chaos engulfing her: water rising through the windows, water dripping through the roof, water filling the street to the level of the stop sign on the corner, while more water pelts from the sky and the wind riles the surface of the newly made lake. The most important similarity is that Kimberly seems to have conceived of her video as a self-contained movie, with a setting, a cast of characters and a narrative that risked ending abruptly in midhorror. There’s more, all of it this powerful, but not that much more. The camera’s battery was good for only two hours of recording. So the decision to use Kimberly’s truncated movie posed a double challenge to Lessin and Deal: how to supplement this footage, to give a picture of the storm that’s more comprehensive but still feels firsthand; and how to expand beyond the storm, to narrate Kimberly and Scott’s wanderings in the following days and months. The answer to the first challenge came the hard way, from eclectic archival research and long hours in the editing room. (You will understand the layered effect when you know that Lessin, Deal and editor T. Woody Richman all worked on Fahrenheit 9/11.) The second challenge was answered by the personalities of Kimberly and Scott, and of a gentle soul named Brian who’d been tossed into their lives and hadn’t left. A lanky recovering addict with deep religious convictions, Brian appears in the film as sideman and foil, clinging to his more robust friends as if they were flotation devices. Give him credit for good judgment. The affable Scott may have a dandyish streak, as suggested by his well-cultivated curls and squared-off goatee; but he also has a scar on his left cheek, from mouth to ear, and in the wake of Katrina he knew how to escape New Orleans by scrounging a panel truck. (The film leaves the details obscure, which I suspect is just as well.) As for Kimberly, she seems at first to be all pugnacious jaw and boisterous, self-dramatizing gestures, until you see her sheltering half a dozen neighbors in the midst of the storm. These are good companions to carry you through a film; and for all they suffer, you’re not surprised when they end their journey a little better off than they began. That’s not the case for the Ninth Ward in general, as Lessin and Deal are at pains to show. In overview, Trouble the Water documents, as other films have done, the fatal indifference of officialdom toward the poor and black of New Orleans, whether that lack of concern was exposed through newscast sound bites or through the casual scoffing of a young, white National Guardsman: “Civilians have no conception how to survive.” And yet the few civilians you see here in intimate view refused to cooperate in their own demise. As Trouble the Water so movingly reveals, some people in New Orleans could emphatically survive–and they were always ready for their close-up. It comes with movie in-jokes, slapstick gun battles, a blackface Robert Downey Jr. and much pre-emptive publicity, in case the people it insults should somehow feel offended. Tropic Thunder is exactly the summer comedy your Nation reviewer wants to see. But since it was not available for viewing by press time, here are notes on some other comic movies that have now been released, immediately following the comic-book ones. I Served the King of England leads my list, because it’s the most brilliantly, expertly cinematic of the summer’s comedies, without fundamentally being funny at all. Directed by the venerable but ever lively Jiri Menzel (Closely Watched Trains) and based on a novel by Bohumil Hrabal, it takes the form of the reminiscences, some of them perhaps fanciful, of grizzled, late-middle-aged Jan Díte (Oldrich Kaiser), who is introduced, circa 1963, as he’s being released from a jail in Prague. For fifteen years, he’s been imprisoned as a class enemy of the Communist regime. Before that, he was a waiter. As the soundtrack comes alive with music (vivace! ), Jan recalls himself when young, lithe, blond and Chaplinesque: an alert little fellow (Ivan Barnev) eager to make money and eager to woo the girls, and buoyantly lucky with both. If the girls were mostly prostitutes, if the money wasn’t always honest, if advancement sometimes came by giving a rival a surreptitious, Chaplinesque kick, well, the world was still magically lovely and bright. This was before Jan’s marriage to a proud German from the Sudetenland (Julia Jentsch)–at last, love with a short woman!–followed by a bit of collaboration with the Nazis. The images become darker in this wartime section, the tone more acidly comic; while in the present-day frame story, old Jan lives in forest shadow, as the proprietor of an abandoned rustic inn visited mostly by his memories. Alternating astonishment and laughter with rueful smiles, I Served the King of England is a deft fable about petty ambitions and enormous crimes, youthful vanity and mature resignation–and, not least, about beautiful young women and dirty old men. You could resist it, but I don’t know why you’d try. Resistance is also futile in the face of Andrew Fleming’s Hamlet 2, the movie that shows how an American life can have a second act, provided its author knows no embarrassment. Steve Coogan, all teeth and hectic sincerity, stars as Dana, the drama teacher at Tucson’s West Mesa High School: a recovering alcoholic and former infomercial actor who mounts his own stage adaptations of inspirational movies (Erin Brockovich, say) in a corner of the cafeteria. Dana strenuously pretends to be happy in these circumstances, perhaps because his wife (Catherine Keener, with belladonna bubbling deep in her throat) is unhappy enough for two. Then comes the complication. The funding for all arts classes is eliminated–this news is delivered in front of a vast display case of athletic trophies–so that Dana, as the school’s sole remaining arts teacher, is suddenly responsible not just for his two chronic drama students but for a cafeteria full of aggressively bored Chicano kids, who have been dumped from other classes. Faced with this challenge, Dana resolves to save his soul, and maybe the arts program, by writing and directing a rock musical sequel to Hamlet. Middle-aged desperation, pedagogical vanity and an acting technique apparently modeled on Liza Minnelli conspire to create a play so grandiosely self-revelatory that it gives new meaning to “theater of cruelty”; but that’s not the best joke in Hamlet 2. What’s really funny is that a bleached, flat, fictitious Tucson, inhabited by a central character of perfect obliviousness, should toss up enough incidental amusements for a Preston Sturges movie: evangelicals, bikers, an adolescent drama critic, Amy Poehler (as an ACLU lawyer), Elisabeth Shue (as Elisabeth Shue) and an entire Gay Men’s Chorus, among others. Ideas for the script seem to have flown in from all directions, but screen credit goes to Fleming and South Park veteran Pam Brady, which should give you some idea. While Coogan, with utter flappability, embodies the self-involved American man in a centrifugal comedy, the stolid Matt Boren portrays much the same type in a comedy that’s inward, quasi-documentary and surprisingly touching: Azazel Jacobs’s Momma’s Man. Set in wintry Lower Manhattan, the film tells the story of Mikey, a 30-ish businessman with a wife and newborn daughter, who comes to New York to visit his parents and somehow can’t leave. The catch is that Mikey’s puzzled and concerned folks are played by the filmmaker’s own parents, Flo Jacobs (a painter) and Ken Jacobs (a grand old man of avant-garde cinema); the apartment where Mikey traps himself is the Jacobs’s actual loft, a vast bohemian nest and workshop so intricately crammed that it brings to mind a set from Solaris; and Mikey’s main occupation–filling up time, with almost nothing to do–is also the method of the movie. Momma’s Man is minimalist, observational comedy taken to the limit, with wonderful success. It works so well, I think, because it’s unsparing toward Mikey; but whenever it lights Flo Jacobs’s face, it’s rapt with love. As for the latest big-budget comedy about ne’er-do-well American men–Seth Rogen and James Franco in this case–as issued from the Judd Apatow factory, Pineapple Express deserves a review in its own style. Imagine my face frozen in close-up, eyes goggled and mouth agape, as I scream: No!